The SkyWest Pilot Pathway Program provides a direct path for exceptional pilots with a desire to Take Control of their aviation careers. 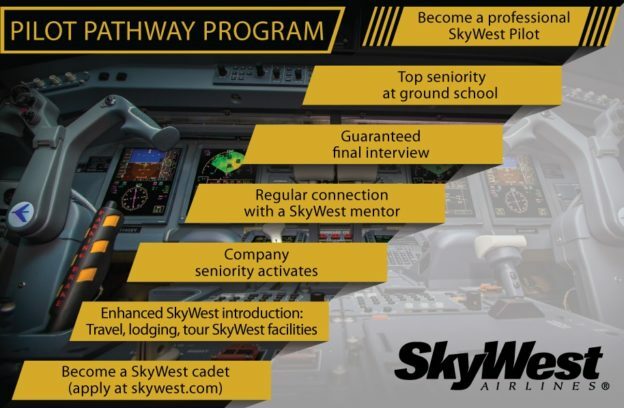 Enhanced seniority, guaranteed final interview, and access to pilot mentors are just a few of the upgrades students can receive by becoming a SkyWest Cadet on your way to becoming one of SkyWest’s more than 4,000 professional pilots. Check out what some of our mentor’s have to say about the program in the video below! The SkyWest Pilot Pathway Program prepares a clear path for pilots to launch their career at SkyWest Airlines, where you enjoy the strong culture of professionalism, teamwork and success that SkyWest is known for. Why wait? Apply Today!